Someone will be president in two days. It will be B.H.O. I will bet anyone reading this $100. Bet soon. Pretty soon it will be too late. It might matter who is president. It might also be an outside issue, not relevant to the thriving living of my life in this moment. What if it doesn’t matter? What if I decide that it does not, that it is a passing moment, maybe one I can make beautiful like a truck at dusk, or maybe I decide I am the street in a drive by shooting…somehow I am involved but not in a way that changes anything. What have I agreed to in my life? Don Miguel Ruiz, a surgeon who left surgery but who returned to surgeons when his heart was failed and who got a new heart from the transplant surgeons, wrote an amazing book asking this question. It took me a long time to understand the question. I was able to answer it as I woke up, only as I woke up. What I agree to defines my freedom. I agree to a contract here with a business that is self-centered; I agree to a lawsuit that wants to me admit something I don’t believe; I agree to beauty being defined by something other than the undertow in my heart that I know is right. My agreements are maybe endless. But I can make decisions to beat back these crazy agreements. What are the ones that matter? What agreement will I make with you that makes us love more deeply? What are the ones that I will teach my son? My only business in his life has to do with safety and respect. I create the first and I earn the second and if I do both of those things he will be as free as I can hope him to be at my hand. Don’t harm anyone, including you, with words. He says to speak with integrity. To me, integrity means doing the right thing when no one else is around. I have never been able to really do this. I wander. But I do know about this and I hold it as part of the standard I would carry on my flag, going in to battle or in to love–they are very much alike inside me. I agree to this. Every single thing I say or do is about me, meaning that I am only telling you about me, even if I say to you, you are 5’7” tall. Chew on this and it will overtake every impulse to whine you ever had. It is true and I agree to this. Try to make it not be true…the more you talk, the less you will talk. I guess you know what this means…just kidding. But you do. This agreement asks us to communicate explicitly and endlessly. We get sick when we are alone and we get better when connected. This agreement addresses this truth. It forces us to make villages, to constantly ask for more, for help, for anything–doesn’t matter what, because the asking is what matters. I agree to this because I am lonely when I am without you. Still be aware, that if you are too much in my space, I will, impeccably I might add, ask you for some room. I just need you to back up. Don’t leave. If you leave, I will assume you have stopped liking me and if you are gone I can’t ask and I will be left with my ridiculous conclusions. It’s a circle like that. This is such an awesomely fair request. I am doing it now. I am writing as well as I can, so I agree. No regrets. A million other things. What I won’t agree to is less important than what I do agree to. What I do agree to dictates my next move. I like these four agreements. They create space for me to love and love is the only thing I know for sure matters. More love in me creates charity, true depth of feeling, light-ness, and beauty. We do everything, I guess, to feel good, or different than feeling bad. We don’t seem to do well with feeling bad for too long. We look for medicines that eventually make us destroy ourselves. These agreements seem to help provide rails for the train of my life to roll on. I think I will write these on the wall of my son’s room. Maybe someday he will wonder about them. This entry was posted in Bend Light and tagged Aperture 3, Bend Light, D700, Don Miguel Ruiz, four agreements, Night, Nik, Nikon D700, surgeon blog, Surgeon Memoir, Truck. Bookmark the permalink. Very interesting…now I need to ponder this. 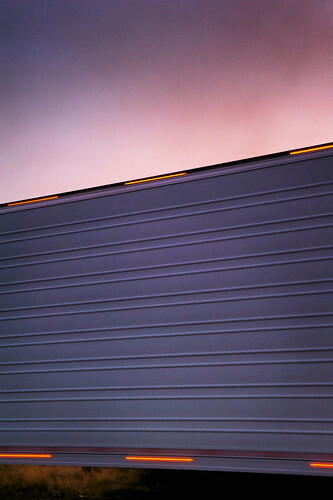 First of all, great photo…..who would have thought that the side of a truck would be beautiful?? Your art is a feast for my eyes. Loving the juxtaposition of light to dark, soft to hard. that finds such beauty in an everyday object. into a metaphor of life. My very essence revealed in the blending of color, and softness, and light. Abruptly interrupted by the hardness of life, with its’ linear construct. Demanding I live within the lines of someone else’s rules and design. Six bars of yellow and orange; trying to hold back the softness? A warning to pay attention? painting it with a softness you can almost touch. I smile at my imagination and fall down into your words. searching for your meaning; your why of writing this. I find my own meaning in them. I love falling into art.